Welcome to AA Podiatry Glasgow. We specialise in the treatment of all types of feet conditions. Our Podiatrists June Harrowell and Pauline Anderson have been working in the business for over 20 years, having qualified from the Glasgow School of Chiropody. We now run our surgeries from two practices, one in Clarkston and one in Shettleston. All podiatrists are registered with the Society of Chiropodists and Podiatrists and the Health and Care Professions Council (HCPC). Nail surgery may be required if treatment and conservation of the existing nail fails. Removal of the toenails is not as difficult or painful as it may sound. Did you know that on average our feet carry us five times around the earth? This can cause damage especially if we aren’t wearing the correct footwear. 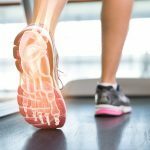 As well as the professional sportsperson, the recreational or weekend sportsperson can equally benefit from a sports podiatry consultation. AA Podiatry shared a live video. Yesterday our in-house MSK Specialist, Michael Stephenson, gave a presentation on how to avoid walking injuries (such as blisters). You can check it out below! If you have any questions regarding your foot health, drop us a message - Michael and the rest of our team will be happy to help! As part of Foot Health Month, the Pod Squad will be live to answer questions and help make sure your feet manage to keep you moving over the distance. Live from 8pm on Tuesday the 23rd April Pod Squad Co-Ordinator and blister buster Gillian Mitchell will be joined by Podiatrists Nikki Claire Grant and Michael Stephenson to take you through the basics and answer your questions. In the UK podiatry is simply the new name for chiropody. The name was changed to podiatry in 1993 as it’s the international recognised name for a foot specialist. Podiatrists diagnose and treat conditions of the foot, ankle, and related structures of the leg. Our aim is to help you care and maintain your feet and lower limbs. We are trained to prevent, diagnose, treat and rehabilitate abnormal conditions of the feet and lower limbs, keeping people mobile and active, relieving pain and treating infections. Podiatry can help with well-known conditions such as athlete’s foot, blisters, corns, calluses, verrucas, bunions, heel pain and gout. It can also help people with other conditions such as nail surgery for ingrowing toenails and help with sporting injuries. As podiatrists, we use a range of homeopathic treatments to cure conditions and help keep feet in great condition. Our feet are what keep us moving throughout the day. On average, we take around 10,000 to 20,000 steps every day. This can be hard wearing on our feet, with 9 out of 10 people experiencing some kind of problem with their feet before they reach 30. At AA Podiatry we can help you combat your feet problems and make walking less painful. Our podiatrists are registered with The Health and Care Professions Council (HCPC) and are members of The Society of Chiropodist and Podiatrists. Routine podiatry treatments require a full review of your medical history before any treatment can be considered. We will take the time to listen to your needs and work together to solve any problems you have. All of our clients receive a specialised treatment plan and advice on how to keep your feet healthy and in optimal condition. Fill in the details below, click the send button and we will be in touch…. For information, advice and news from AA Podiatry across both surgeries. There are three types of arthritis: Rheumatoid, Osteo-arthritis and Gout. Gout is the result of an imbalance of uric acid in the body, and affects more men than women. Most of us have suffered from foot perspiration from time to time, yet for some people, sweaty feet are a persistent problem which can be embarrassing and uncomfortable. The heel is a specialist part of the body designed to cushion and absorb the impact of your body weight. Heel pain can be very disabling, making every step a problem. Highly recommended if you suffer from any feet ailments. Attended the Shettleston clinic to have ingrown toenails surgically removed. The surgery itself was efficient and completely pain free and Pauline and June (the podiatrists and founders of AA Podiatry) were great at what they do and keep your mind at ease while the surgery is taking place. Will certainly return if I have any problems with my feet in the future.